Zig Ziglar's Little Book of Big Quotes includes 27 pages of quotes that will inspire, encourage and motivate you. Zig says, "I hope this book will make you think, give you new ideas, and extract more of the potential in you." 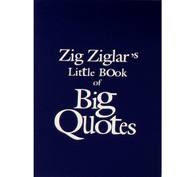 The book includes quotes about ambition, happiness, attitude, integrity, success, self-image and more. These are perfect gifts for business associates or personal friends! "Ambition, fueled by compassion, wisdom and integrity, is a powerful force for good that will turn the wheels of industry and open doors of opportunity for you and countless others." "You cannot tailor make the situations in life, but you can tailor make the attitudes to fit those situations before they arise." "The door to a balanced success opens widest on the hinges of hope and encouragement." "With integrity you have nothing to fear, since you have nothing to hide. With integrity you will do the right thing, so you will have no guilt. With fear and guilt removed you are free to be and do your best." "Success is one thing you can't pay for. You buy it on the installment plan and make payments every day."